For nearly 30 years, The Crazy Quilt Handbook has been the essential guide to the fine art of crazy quilting. Now this perennial bestseller has been updated with more of everything that makes crazy quilting wonderful: gorgeous stitches, embellishments, fabulous crazy quilt photos, and updated projects to make. Learn all the ways crazy quilting can be used to decorate clothing and accessories, beautify your home, share family memories, and create heirlooms for future generations. This is the must-have resource for any crazy quilter, from beginners to experts. 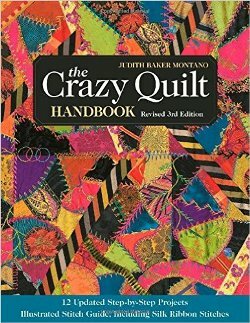 Updated and expanded edition of the best-selling crazy quilting guide from Judith Baker Montano. Includes 12 beautiful projects, a dictionary of 37 embroidery and silk ribbon stitches, and instructions for additional embellishments.